Lain's bear suit appears several times in the anime. It provides her with comfort when in intimidating situations, such as when using a NAVI for the first time in a long time, or when speaking with her family. It also functions as Lain's pyjamas. Lain also has a bear hat that appears only in Layer 01 when she turns on her NAVI. 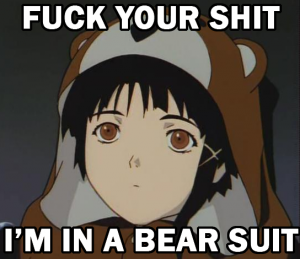 Although its screentime is very limited, the bear suit has left a powerful impact on the fandom and bear motifs can be seen in a lot of Lain fanart. This page was last edited on 4 February 2013, at 10:33.